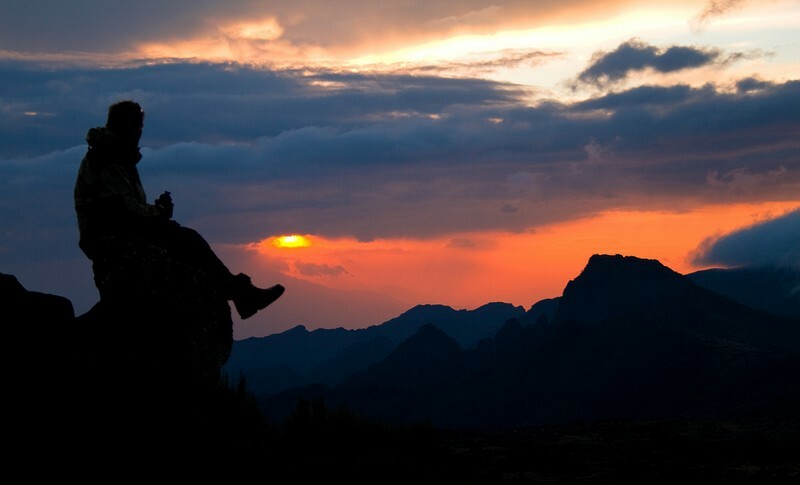 Climbing Kilimanjaro on the Shira Route means to invest some time and money. Those routes both cross the Shira Plateau before joining the Machame Route near the "Lava Tower". Starting your climb on the western side means paying for extra transport. Using a longer trail means paying for an extra day on the mountain. And climbing a less trafficked route means higher prices due to less competition from budget tour operators. On the plus side a longer route means a better chance to acclimatize to the altitude and better summit chances. The fact that you are likely to climb this route with a quality Kilimanjaro tour operator also means your success chances are much better than average. And if your operator has developed your itinerary in a way that avoids the big traffic surges on the Machame trail (some operators do) you should have a great climb all the way, on one of the most scenic routes, without the crowds that plague the popular trails. View of Kibo from Shira Plateau, photo by blhphotography. There is one thing about the Shira Route that sets it apart from all other Kilimanjaro climb routes: the first section of it is a 4WD track. It is possible to drive up a fair way and begin your trek at a considerable altitude. If you are someone who lives at sea level and tries to squeeze in a Kili climb, taking only one week off from the the office, then this could trip you up. Shira certainly allows plenty of time for acclimatisation during the later stages, but some people can develop altitude sickness symptoms at those lower altitudes already. And catapulting yourself from sea level to a height above 3500 m/11500 ft the day after arriving in Tanzania may not be the smartest thing to do. But for most people it won't be an issue at all. If you had a day or two in Marangu, or have done some other trekking and acclimatization beforehand (for example climbing Mt. Meru), then you won't have any problems even with this rapid start. Just thought I point it out, because I know people DO try to squeeze climbs into one week and to cut costs where possible (i.e. the cost for another night in Marangu or Moshi). Also, the itinerary I describe below is the slower version where you walk all the way. 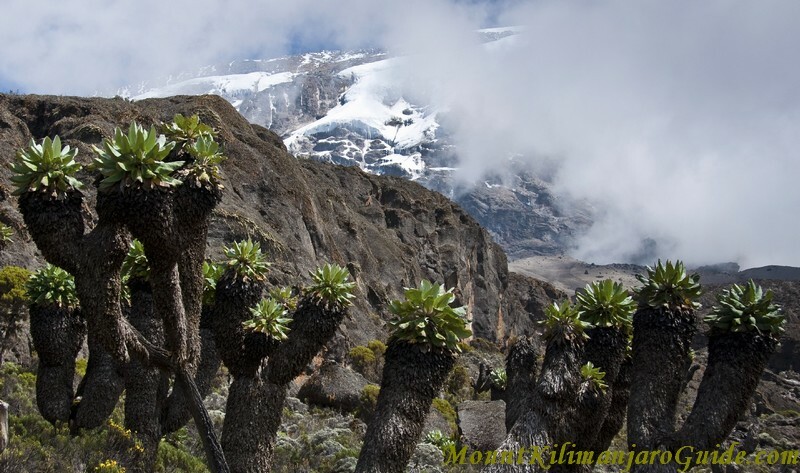 Below are some more detailed notes about what to expect during a Kilimanjaro climb on the Shira Route. Londorossi Gate, the registration point for the Shira Route, photo by mitchpa1984. There are many possible slight variations to the Shira route, so don't be surprised if you see an intinerary that mentions different camps and different heights. 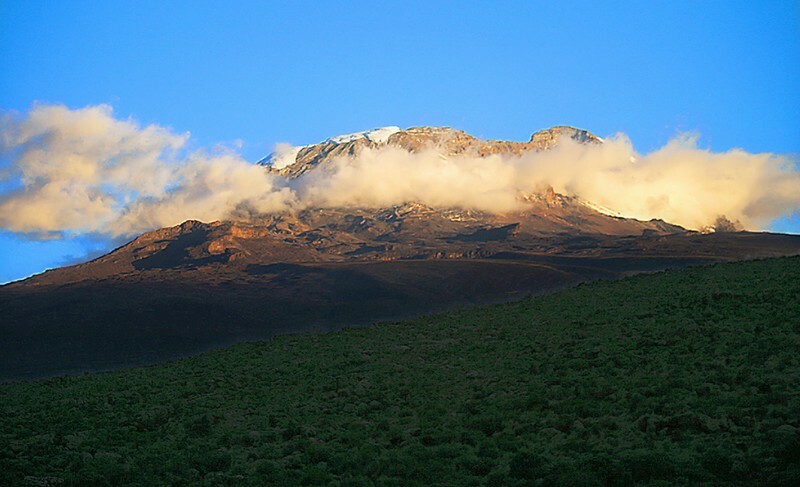 The itinerary below describes a six night/seven day Kilimanjaro climb on the Shira Route. Like Machame this trek can be shortened if you skip the night in the Karanga Valley and instead walk straight from the Barranco Huts to the Barafu Huts in one day. It can be shortened more by driving instead of walking the first day and skipping the first camp. The trek can be extended by adding an extra night at Moir Huts for acclimatisation. For experienced mountaineers there is also a challenging and dangerous specialist version via the Western Breach. Views over moorland, photo by Armstrks. The starting point for the Shira Route is the Londorossi Gate (same as for the Lemosho Route). It is a two to three hour drive to get there and on this first day you may well spend more time driving and waiting around at the gate than you will be walking. Londorossi (name for the village and the park gate) looks like something pulled out of a cheap Western. The place is entirely made out of wood. The high timber fences you see are supposed to keep the wildlife out. That already indicates another advantage of taking one of these lesser trafficked routes. You do indeed have a better chance to see some wildlife on the first days, though this applies to Lemosho more than to Shira. But everybody does have a good chance of seeing the beautiful black and white Colobus monkeys, because some of them have taken up residence in the trees right next to the park ranger quarters. Check them out while you are waiting for the registration and permits to be organised - the usual start of a Kilimanjaro climb! This skips the first camp and drops you at a height of about 3500 m/11500 ft! 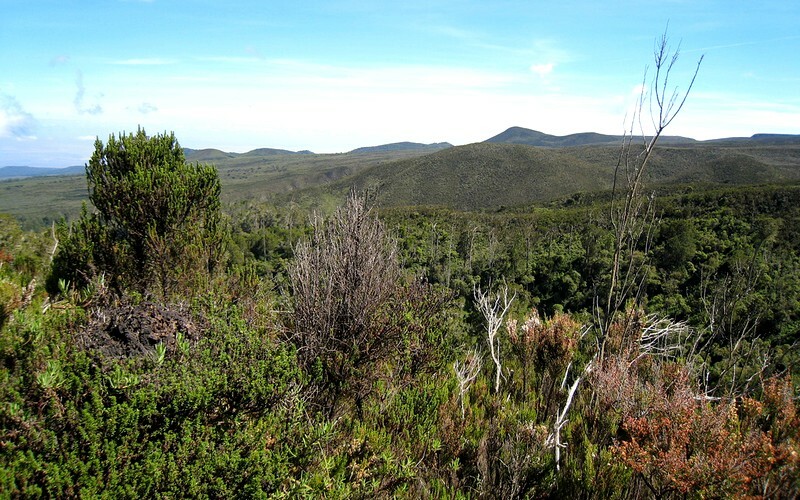 You follow the Ngarenairobi River as you leave the forest and enter the next vegetation zone: moorland and heather. Your first campsite is located between the road and the river. If you choose to walk, then the first day takes you up to six hours (with breaks) or much less, depending where exactly you start walking. Sunset on Kilimanjaro from Shira Huts, photo by Stig Nygaard. The next day begins with a steady climb up the slope towards the Morum Hill and Morum Barrier. This is where the Shira Plateau begins (and half of the climbers begin their Shira trek). The road continues after the gate, but only emergency vehicles are allowed here. You now start heading south east on a mostly flat path across the plateau. In another two hours you reach the junction of the Shira and the Lemosho Route, the location of the Simba Cave Campsite (3590 m/11780 ft) on the side of the Simba River. Not long after you pass the turn off to another campsite, called Fischer Campsite (3885 m/12745 ft), which is some way off the main trail. There is an alternative route to get here, a detour past the Shira Cathedral and a climb to its summit (3720 m/12200 ft). The huge buttress of rock is surrounded by steep needles and pinnacles. It's scenic area with a real sense of wilderness, certainly worth the detour. Senecios in the Barranco Valley. © Uta Philipp. Soon you come across the first junction. One option is to add an acclimatization day here and continue your trek to Moir Huts (4140 m/13579 ft), thirty minutes off the main trail. This is a scenic and quiet campsite in a valley surrounded by steep slopes, possibly the quietest camp on the mountain. If your operator takes you here you will arrive around lunch time and spend the afternoon exploring the Lent Hills, including an acclimatization walk to 4700 m.
The other climbers continue on the main trail. After some bends and ups and downs you reach the junction with the busy Machame Route. Shortly after you come to another junction. You have the options to either head towards the Lava Tower as a detour or even for another extra night, or to continue straight on towards Barranco. The Lava Tower is a 100 m/300 ft volcanic plug, left over from times when Kilimanjaro was volcanic. The path towards it is a gentle slope and as you climb towards it even the short heather disappears altogether to reveal the rocky ground of the lava ridges. The climb is often experienced as strenuous. After all, you'll be climbing up to over 4500 m and your body will sure notice the the lack of oxygen! The Barranco Camp is without a doubt the most spectacular campsite of this route, with fantastic views of Kibo, the Western Breach and the first of the southern glaciers, a fitting reward after a strenuous day. Don't be surprised if you have slight symptoms of altitude sickness. You have been quite high today, but by climbing high and sleeping low you are giving your body the best chances to adapt. Don't be disheartened about the loss of hard earned altitude. This was an important day for acclimatisation. You can read the detailed description of this part of the Shira/Lemosho/Machame routes here.